1 photogrphic print : b&w; ; 5 x 7 in. Published in Rafu Shimpo, March 26, 1970. 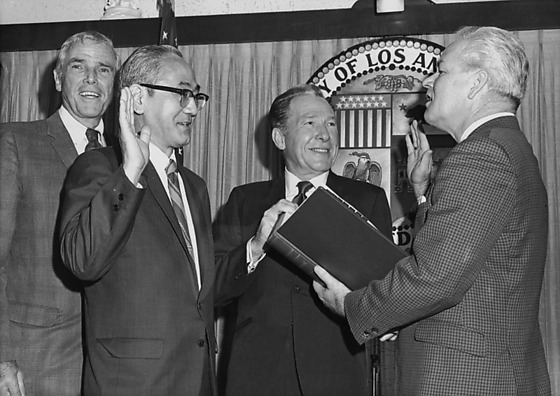 City Clerk Rex Layton swears in Tetsujiro Nakamura as Commissioner of Community Redevelopment Agency (CRA) Board while Los Angeles Mayor Sam Yorty looks on in his office in Los Angeles City Hall, Los Angeles, California, March 25, 1970. 3N: Mayor Yorty posing with two Caucasian boys and two Japanese and Caucasian girls in office. One boy holds a scroll. Typed on original envelope: Sam Ishihara -- Commissioned -- Mayor's office.